James Garrett Jr. has been reappointed dean of the College of Engineering. In announcing the reappointment to engineering faculty and staff, Interim Provost Laurie Weingart praised Garrett for demonstrating his strengths and accomplishments as dean with his leadership of a number of initiatives, including the establishment of new College of Engineering buildings and infrastructure, such as the ANSYS Building, the Maker Ecosystem and the TCS Building. She also cited Garrett’s leadership of the strategic branding and launch of the CMU Africa campus and his support of important new research initiatives, including the NextManufacturing Center and Laboratory, the Bioengineered Organs Initiative and the Metro21 Smart Cities Institute. 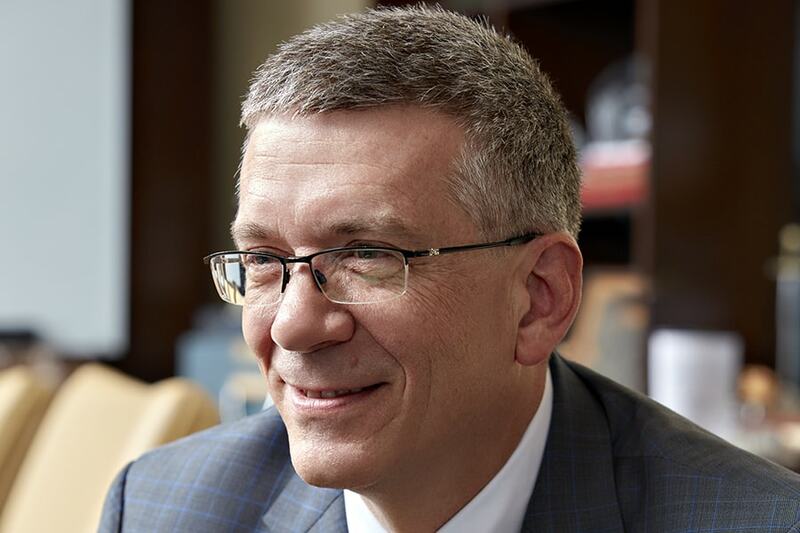 Weingart called him a “collaborative and inclusive leader.” In addition to dean, Garrett is the Thomas Lord Professor of Civil and Environmental Engineering. He earned his bachelor’s (1982), master’s (1983) and doctoral (1986) degrees in civil and environmental engineering from CMU. ﻿Kim Hochstedler, who graduated with a bachelor’s degree in psychology and statistics last month, has received an NCAA Postgraduate Scholarship for excelling in academics and athletics. A member of the Tartans’ swimming team, she is the 12th from CMU to receive the $7,500 NCAA Postgraduate Scholarship since 2007. Hochstedler was a straight-A-student who received numerous awards this year, including the William Brown Academic Athletic Achievement Award, which is given to the male and female student-athlete who earned the highest grade-point average while participating in intercollegiate athletics for four years. In the pool, she earned All-America honors with a fifth-place finish in the 200-yard breaststroke at the NCAA Championships this year. She set four school records, while leading the team to its best NCAA finish (15th). Hochstedler plans to use the scholarship to pursue a Ph.D. in biostatistics at the University of Michigan. Find out more. ﻿Amanda Thiele, a setter on the women’s volleyball team and a member of the Class of 2018, received the Department of Athletics’ Michael C. Murphy Citizenship Award, given to a senior student-athlete who has demonstrated character, sportsmanship, service and impact. Thiele was a volunteer with the Hospital Elder Life Program at UPMC Shadyside and with Global Public Health Brigades, for which she traveled to Nicaragua to build bathrooms and concrete floors for families in Estelí. She also helped to dig trenches for water piping for a rural village and traveled to Ghana to work in Volta Regional Hospital. On campus, Thiele has served as a residence assistant, secretary of Plaidvocates and has been instrumental in many initiatives. ﻿Bryan Jangro, a quarterback on the football team and member of the Class of 2018, received the William Brown Academic Athletic Achievement Award, which is given to the male and female student-athlete who earned the highest grade-point average while participating in intercollegiate athletics for four years. Jangro maintained a 4.0 GPA and earned his bachelor's degree in business analytics. He will be working for Lazard in Chicago as an investment banking analyst. Alumnus James Garrett Jr. has been reappointed dean of the College of Engineering.